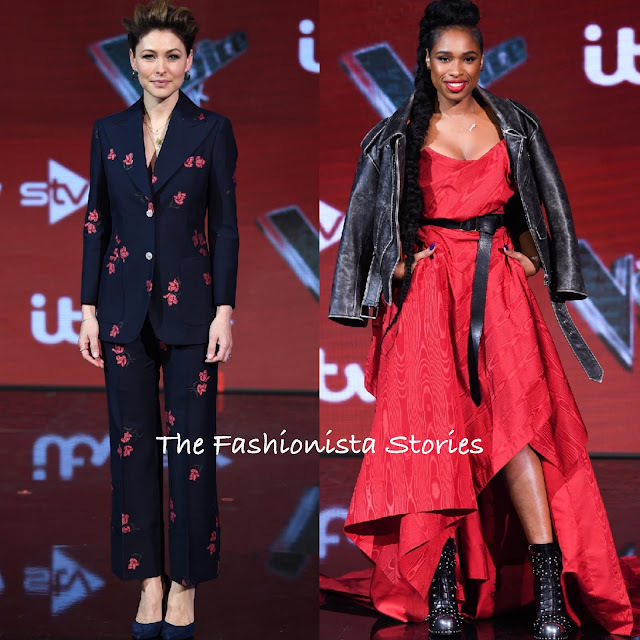 Yesterday(April 5th) Emma Willis and Jennifer Hudson posed for pictures at 'The Voice' UK final photocall at Elstree Studios in Borehamwood, England. Emma Willis looked great in a navy & pink floral GUCCI two-piece suit which she teamed with navy suede SAINT LAURENT pumps. Gold jewelry, minimal make-up and a short pulled back cut. Jennifer Hudson went the biker chick route wearing a red strapless high-low hem dress with a belted waist. She toughen her look with a black leather moto jacket black leather & silver studded boots. I like the idea of this look but I am not sold on it. However because of the occasion, it actually works. NABELA CHAN jewelry finished up her look.